On Hartwick College Week: Why is one piece of art “better” than another? Steff Rocknak, professor of philosophy, discusses how a human touch could make the difference. Dr. Rocknak is also Hartwick’s director of the Cognitive Science Program and a professional sculptor. 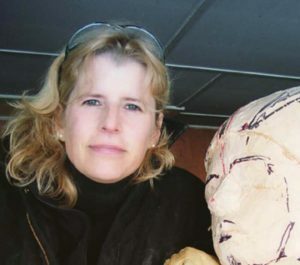 She has won numerous prizes for her art work, including an Alex J. Ettl Grant from the National Sculpture Society in 2018. In 2014, she won an international competition sponsored by The Edgar Allan Poe Foundation of Boston. Her vision of Poe, which reflects his “conflicted relationship with the city,” now stands as a 5’8,” 1,000-pound bronze sculpture in the city’s Back Bay neighborhood. Her work has also been featured in multiple publications, including The New York Times, The Boston Globe and The Huffington Post. Artists often embrace the new for the sake of the new—and for the sake of nothing else. The new, somehow, has been divorced from the better. This divorce might be, in part, a symptom of postmodernism, namely the conviction that all we have is “the new” because there is nothing else, particularly, there is no truth, therefore there are no real standards. Thus, nothing is “better” than anything else; it’s much easier to spot what’s different. But how can we identify “better” art, apart from its newness, or originality? By determining how honestly it captures the human condition—regardless if the artist expresses himself in, say, an abstract or traditional manner. The term “human condition” pertains to those qualities that obtain of most human beings, regardless of gender, race, time period, etc. For instance, almost all of us think about death, fall in love, get betrayed, grow older, and so on. Thus, the artist must show us what it means to be human, not what is new. Of course, she might do this in a new or original way, but this is not what is most important. This is why so many of us can genuinely relate to works of art that were completed hundreds or even thousands of years ago; the message is perennial.